Try our Interactive Map to find all the Places to Visit in Cornwall. Locations and links to all the attractions websites are included. Or scroll down for a list of the Places to Visit in the Far West region of Cornwall, with descriptions and website links included. Yew Tree Gallery is located on the West Coast of Cornwall equidistant from Morvah and Pendeen in the courtyard of Keigwin Farmhouse, nestled into the lower slopes of Penwith's Moor and facing the Atlantic. Established in 2001 it features a variety of exhibitions from paintings to sculpture, from wood carvings to jewellery, from etchings to photography and even ash and willow furniture. 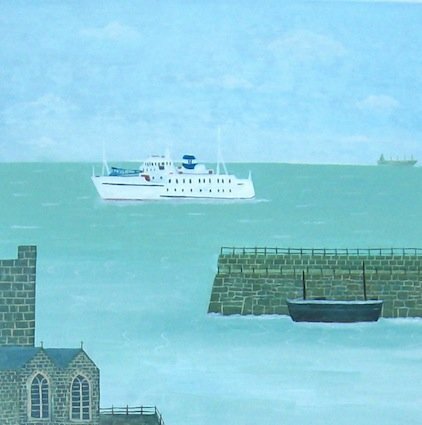 Market House Gallery shows a constantly changing exhibition of Quality Post War and Contemporary Cornish Art, Sculpture and Ceramics featuring artists from the past and present. 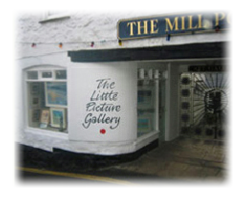 The Little Picture Gallery is located in the quaint and pretty harbour village of Mousehole and features the work of many local and well known traditional, representative and naive artists. 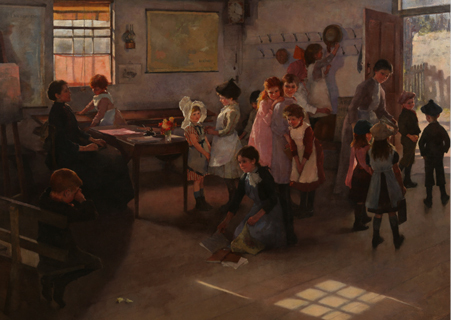 Penlee House is both an artists gallery and museum, the only Cornish public gallery specialising in Newlyn Artists (c 1880 to c 1940) it is set in an elegant Victorian House and Park. The museum covers the archeological and social history of West Cornwall and features large collections of, for example, early tools and arrow heads. There is also a fascinating collection of natural history with birds, birds eggs and birds nests on display. There are photographic exhibitions which also include some original period postcards. Penlee House has won several visitor attractions awards and offers a cafe and shop to complete your visit. 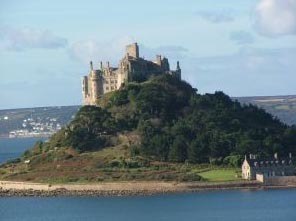 Still home to the St Aubyn family, St. Michaels Mount is set on 22 acres and approached by a causeway at low tide. Small boats ferry passengers to and fro when the tide is in and make for an interesting start to your visit. Maintained by the National Trust the mount has 10 acres of superbly maintained gardens for you to enjoy and has been designed with many terraces so it can be viewed and enjoyed from the castle itself. There is a large selection of interesting and unusual plants and exotics to acquaint yourself with and the seeminlgy harsh environment appears to suit them as they flourish in these conditions. There are many grassed areas where you can picnic and plenty of rock formations that can make impromptu seats when you just want to sit and take in the stunning sea and beach views. You may get lucky and spot a dolphin, seal or even a basking shark which regularly visit the coastline here. Bonython Estate and Garden was established in 2001, open from 1st April to 30th September it covers an area of 20 acres and features 3 lakes. Spring colour is a particular treat to the visitor with tulips, rhododendrons, azaleas, woodlands flowers and bulbs. There is an 18th Century walled garden which creates a micro-climate providing shelter from the wind and frost, here you will find clematis, wisteria and tree peonies. 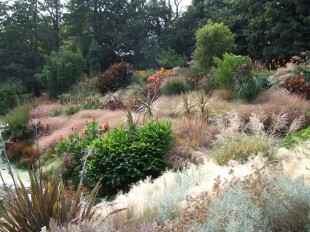 It also features long herbaceous borders with a colour theme of mauve, purple and blue. The 3 lakes are a summer spectacular with hot summer planting including dahlias, allimus and phlox all of which are white, complemented by South African perennials and grasses. 70 acres of enchanting gardens and grounds featuring one of Cornwall's largest and most diverse plant collections set within magnificent formal, informal and woodland areas. The gardens include numerous specimen shrubs and trees, a stunning bluebell valley, ornamental lake with picturesque Victorian Boathouse and formal cascade, Sunken Italian Garden, Serpentine Yew Tunnel, extensive Pinetum, Bamboo collection, atmospheric Rockery and Grotto, the Great Lawn and Summer Terrace and many other interesting features. Intimate and closely linked to the picturesque stream running through its valley, the garden leads up to a terrace and summer houses with splendid views across Mount's Bay to The Lizard. The walled gardens contain many rare and unusual species which are difficult to grow in the open anywhere else in the country. Trerifife Park at Newlyn has been the home of the Le Grice family since 1821. The site has been identified by the name from as early as 1201. The name originates from the Cornish for a farmstead in the original ownership or working of the original settler of the name of Eruf. Architecturally, this is one of the most interesting houses in Cornwall, being a fine and typical example of the houses in the beginning of the 18th Century. The House is listed Grade II with the stables and adjoining walled gardens and was featured on the Channel 4 programme 'Country House Rescue'. Mousehole Wild Bird Hospital & Sanctuary was founded in 1928 and is a genuine sanctuary and hospital for approximately 1500 birds a year needing care with the aim of returning healed birds to the wild. This registered charity is located at Raginnis Hill, Mousehole, Nr Penzance TR19 6SR Tel: 01736 731 386. Open daily with free admission and donations kindly accepted. Experience animal welfare in action at Cornwall’s only Seal Sanctuary and rescue centre. Hear about dramatic rescues and meet the seal and sea lion characters whose individual stories are brought to life during your visit. The Sanctuary is also home to fun loving otters, playful penguins, potty paddock animals and a rock pool hosting a wide range of marine creatures. Tucked against the picturesque backdrop of the Helford River, the Sanctuary is a designated site of special scientific interest and an area of outstanding natural beauty. Our 40 acre centre also boasts a woodland quiz trail, café with undercover seating, and two gift shops. Don’t miss out on our great all year round events calendar. Open daily from 10am except Christmas Day. Please call or email for closing times. Dogs on leads always welcome. Groups discounts available for advanced bookings of 10 or more. 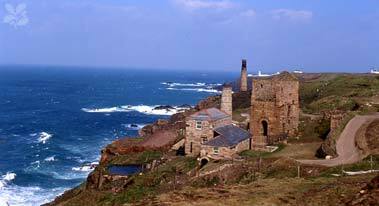 Just half a mile away from Geevor Tin Mine is the National Trust owned and restored Levant Mine & Beam Engine. Perched on the cliff edge is a tiny engine house in which an historic beam engine is now once again in full steam. There is an underground tour and also on display are winding and pumping shafts with a recently restored electric winding engine. The steam engine is operational from the beginning of March to the end October and full details can be seen on the National Trust website. A day out at Geevor Tim Mine and Levant Mine & Beam Engine is an absolute must for anyone interested in Cornwall's internationally famous industrial heritage. Located at Pool near Cambourne, The Mineral Tramways Discovery Centre is an ideal place to find out about the old mineral tramway routes between Hayle, Portreath and Devoran as well seeing the remains of the mines they served. With trails and footpaths, the area is ideal for exploring the industrial heritage of Cornwall. There are a number of well defined trails such as The Great Flat Lode Trail to follow on foot, on bike or better still, on horseback. The Great Flat Lode itself is a great example of a mining landscape and has been proposed as a World Heritage Site. Poldark Mine, a free entry site, offers a fascinating insight into the life and works of 17th & 18th Century Cornish tin miners. Set in the beautiful Wendron Valley, close to Redruth, Poldark Mine was originally known as Wheal Roots and changed it's name in recent times to reflect it's connections with the Poldark TV drama. There are lots of things to do at Poldark Mine - you can take an underground tour, visit the Museum, relax in the Garden Café and browse the comprehensive range of local craft and antique shops. For kids, there is a play area and amusement arcade as well as craft workshops such as candle making, pot painting, wood turning and panning for precious stones. For opening hours and other information, visit the website. The Lizard is the most southerly point of mainland Britain and the turning point of one of the busiest shipping lanes in the world. The coastline on either side offers dramatic cliff walks, masses of rare wild flowers and fascinating geological features. The area played a key role in the history of modern communications. And you can visit the Lizard Wireless Station and the Marconi Centre at Poldhu. Two miles north of Lizard Point lies Kynance Cove - white sand, turquoise water and islands of multi-coloured serpentine rock with stacks and arches hidden amongst the towering cliffs. 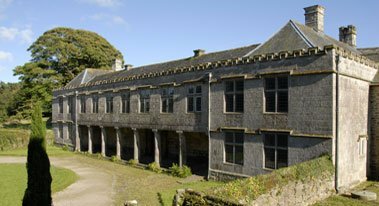 The Godolphin Estate is Historic landscape offering extensive walks and wonderful views over west Cornwall from Godolphin Hill. The National Trust acquired this ancient 555 acre estate in 2000 and have made and are making; improvements to public access. From Godolphin Hill there are wonderful views over west Cornwall. There are more than 400 recorded archaeological features which range from Bronze Age enclosures to dramatic 19th-century mine buildings. The dramatic scenery of Land’s End combined with an extensive visitor centre and range of attractions ensure a great day out for all the family. There are magnificent cliffs, seabirds and wild flowers so see and over 20 separate shops, cafes and attractions to visit. At the heart of the Penrose Estate lies Loe Pool, Cornwall's largest freshwater lake that meets the sea at the dramatic shingle bank of Loe Bar. Surrounding the Pool is a mix of rich farmland and woodland through which there are many paths, including the 5-mile circuit of the Pool itself. Wildlife is in abundance here, including many birds and mammals including notable species such as the otter. At Gunwalloe, two sandy coves lie either side of the 14th-century church (not NT) and the valley reed bed provides a haven for bird life. The Acorn is a full-time theatre offering a broad base of performing arts and cultural activity all year round. The programme run by The Acorn is very varied and ranges from theatre to music to dance to film to cabaret - something for everyone. The Minack Theatre was created by Rowena Cade in her cliff top garden over a long period, starting in 1931. Minack looks as though it was built by the Romans but instead, it was Rowena’s vision that crafted and built the theatre in such a ‘rocky place’ (or ‘Minack’ in Cornish) for a performance of Shakespeare’s ‘The Tempest’ . Truly an inspiring experience, an afternoon or evening at The Minack is a must for any visitor to Cornwall. Tickets for Minack performances can be bought on-line though the Minack Theatre website:http://www.minack.com/ or by calling the Box Office on 01736 810181 or 01736 810471 . Established nearly 30 years ago the Flambards Experience is one of the most popular days out in Cornwall. Not only does the Theme Park have thrill rides in Cornwall, but also the Flambards Victorian Village and Britain In The Blitz indoor attractions.